The art of selling and pitching search engine optimization services to local businesses can be challenging. The idea of getting on a cold call to ask if a nearby gym needs SEO is flat out terrible. It’s awkward and will almost always result in a no. At TM Blast, I use Google and SEMRush to show the value of search for their business and what I can provide. If you are looking for help, I offer SEO Services that can help grow your online business. Cold calling a nearby business to pitch digital marketing is not a grand strategy. Instead, I suggest you use Google and SEMRush to find these opportunities for that potential client. Let’s pretend that you specialize in dentistry SEO services. 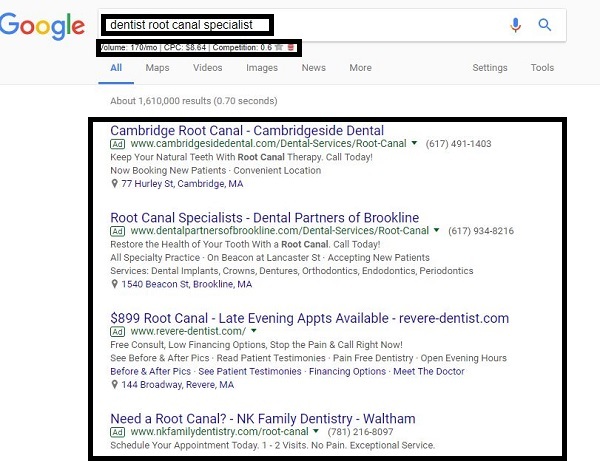 You want to help local dentists in a specefic area gain more organic visibility, but you can’t find a way to make a compelling case for them to buy into online marketing. Here are the steps that I would take to find a client in that field. Here is an example of a term that I want to look into from Google. I use Keywords are Everywhere to get an idea on what the search volume is along with the cost per click when I perform a Google search. The cost per click is more important in my opinion because I want to remember that number when I make the pitch. The search volume, in my opinion, is artificially low because the tool uses Google AdWords data, but it’s more about getting a baseline number. I manually add the advertisers I see on Google into an excel spreadsheet. It’s important to know who the competition and what the industry is spending their money on. In Google, you can find who and advertiser is because they will have a green ad box next to their domain name. Take one of the advertising domains and put it into SEMRush to begin the report. The key is to change the settings to look for advertising research so you can see how much that advertiser spends per month. You can then scroll down on the paid search positions to see a sample of the paid keywords the advertiser is bidding on. Here is an example of a domain I am looking at that runs Google ads. When I use SEMRush, I can see that they spend about nine hundred dollars per month. That means every month they pay nine hundred dollars to Google for a handful of clicks. I can export the sample AdWords that they bid on and run another report in SEMRush to see where they rank on the organic side. The goal is to find the advertiser ranking on page two or beyond for these terms organically. You can then craft your pitch to let them know that you can help their organic ranks rise. 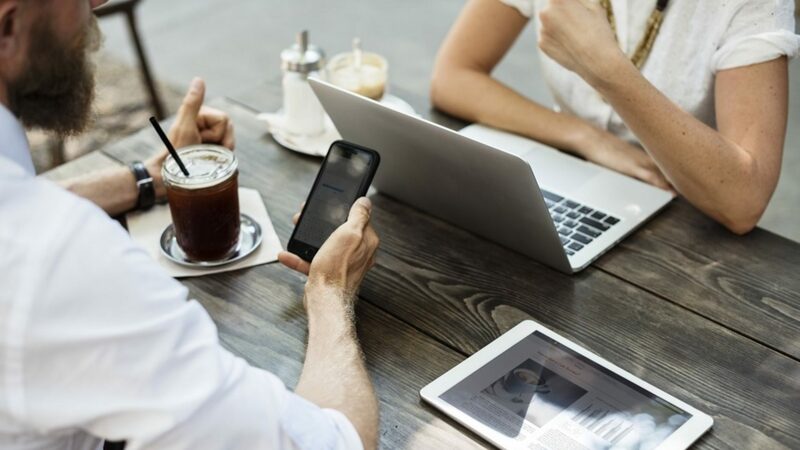 The thought of relying less on paying every time for a click will be the most intriguing part for the prospective client. This example above tells me that they get about one hundred and fifty-five clicks each month for almost one grand in ad spend. You can then do the math and say that the average cost per click comes out to six dollars. This number does not include any other paid media like Bing, Facebook, programmatic display ads, and offline advertising. It can be safe to say that this dental business is spending far more than one thousand dollars each month. One thing I have to stress is that you can’t merely copy this strategy and see immediate success. You need to have case studies on your website that showcases the work that you do. You should also rank organically for something or else it looks like you can’t perform this service. Here is an example of a term that I rank for at the local level. That means that if you perform this search in Colorado, you will not see my business. My website goal is to show up for local search, so that aligns well with the pitch to the client. What’s important to point out to clients is that the average cost per click for this term is over fourteen dollars. 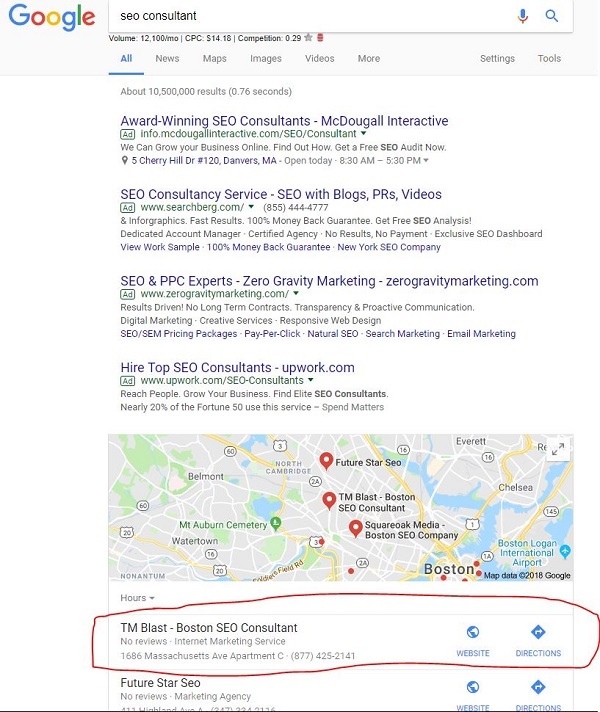 When you sell this service, you can mention that you rank organically in the maps section and don’t have to pay that cost per click to show up on Google. Here are some stats and facts you can use to help boost your proposal to the potential client. More people use their phones to search then do on a desktop. That means that people are on the go and searching for local actives and places. Here is the link of 24 Eye Popping SEO Statistics if you want to add more to your proposal. When it comes to selling and pitching SEO to local clients, you have to play smart. These potential clients receive cold call emails all day from random vendors. These sale tactics sound the same because they come from a template that is a copy and paste document. The email will say that there is an issue on that person’s website and SEO can help fix this problem. I hope my example above will change how you pitch and sell to local clients. Showing the client true and thoughtful value will go a long way. These business owners are savvy and understand that they need the web to advertise their business. They are running ads on Google, so you already know they get and buy into this strategy. The key is to show what SEO can do for a client.